Freezer Bags There is 1 product. Take a look at our ever growing freezer bag range and choose just the right size and thickness for your contents! If you’ve got a freezer then you’ll need freezer bags. And if you need freezer bags then you’re in the right place because we’ve got rolls and rolls of them. They’re food safe, freezer safe and very economical. So if you’ve got a catering company, a busy restaurant or even a large domestic kitchen that’s always buzzing with family and guests, you’ll be able to order serious quantities and keep the extras in the store cupboard for future use. Of course freezer bags don’t just need to be used for food. A variety of other industries and services use freezers as part of their everyday processes, and many of them use freezer bags and containers to store and defrost. Likewise, many businesses use freezer bags even when they’re not for the freezer or fridge. Schools and suppliers who need to organise collections of items – toys, ingredients, craft items, stationery and other resources – use freezer bags for the convenience of collecting things together in one place and being able to see at a glance what’s inside. If you need to be able to seal the bags, there’s a choice of solutions, depending whether you need permanent or temporary sealing. Bag ties, heat sealers, bag neck sealers, tapes – even ribbons and bows if you prefer! When you order from us you can be sure you’re getting professional quality that you can trust. Don’t waste money on cheap freezer bags that aren’t up to job or you’ll lose money in the long run. With our bags you get great protection, high volumes, high quality, and all at prices that are really economical. 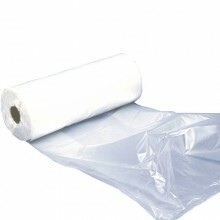 Freezer safe bags in clear polythene. Supplied in single roll quantities. Each roll has 500 bags. Read the full product description.